When you know a coworker’s personality type, it becomes much easier to interact with them. Being able to tell the difference between a D, I, S, or C personality type can help you navigate all kinds of tricky office dynamics. Working together on a project, meeting collaborative deadlines, and daily interoffice communication all becomes simpler once you have a handle on the dynamics between your personality and theirs. But how can you pinpoint someone’s personality in the workplace without using a DISC test? Why not start by looking at their desk? A person with a desk like the one in the picture above is likely a “C” personality. There’s no clutter, and the amount of items out on the desk is minimal. Even looking at this desk from a distance, you can tell that everything’s in its place. If you were to catch a glimpse of an open drawer, you’d see the same kind of organization mirrored there as well. 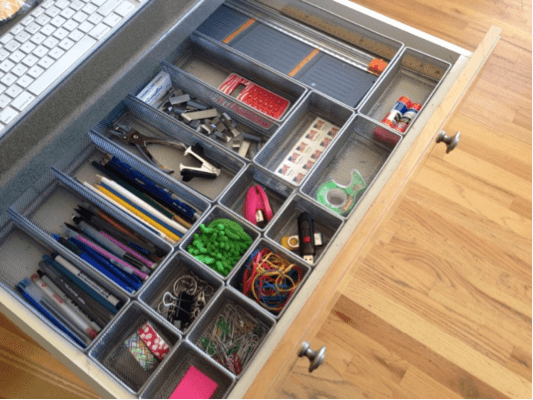 Look for a drawer organizer, with everything neatly compartmentalized. This is the hallmark of a personality type that likes everything orderly, and has difficulty performing up to their potential in a chaotic environment. If you see a desk that’s been decorated with homey, personal touches like plants and photographs of the family, you’re likely looking at the workspace of a person with an S personality type. An S likes their office to be an extension of home, and doesn’t function well in environments that are cold or impersonal. 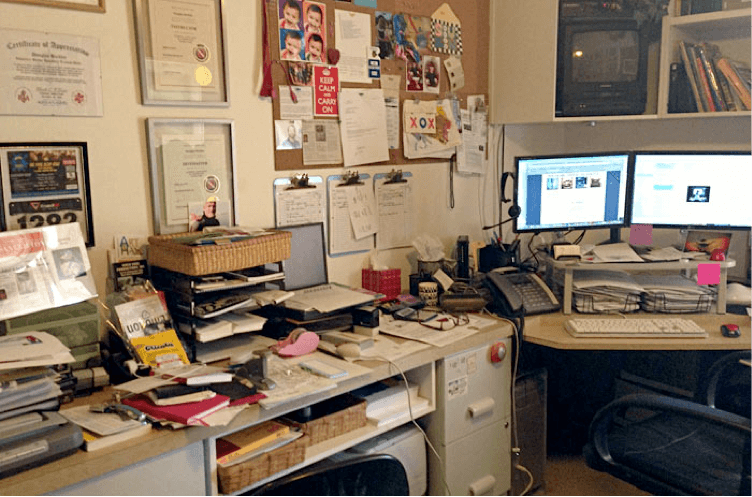 If you see a desk where things are piled on the surface with what appears to be little rhyme or reason, you are likely dealing with an I personality. This isn’t to say that people with I personalities are messier than other personality types, It’s just that when it comes to organization, they just don’t have the patience. They don’t mind clutter, and like being able to see everything at once. In fact, even though it might appear to you that there’s no organization going on, it’s a safe bet that the person with the I personality can tell you exactly where everything is. In other words, they probably do have an organizational system, it’s just not one where everything is put away in a drawer or cubby. 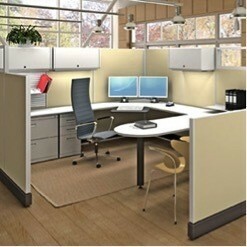 Bottom line: The energy and activity of the I personality is personified by the whirlwind that is their desk. 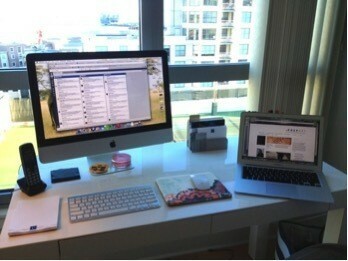 The desk of someone with personality style D can be a little tougher to spot. Theirs won’t be a stark and minimal desk, but it will definitely be more organized and impersonal than the workspace of an I or S. The main thing to look for is a desk surface that is uncluttered with unnecessary items, where everything that gets a lot of use is out in the open. The goal of the D personality is to maximize efficiency and get things done as quickly as possible without compromising quality. They want everything at their fingertips, so they can get to things fast. There won’t be anything extra out on the surface, or unnecessary items that might be obstacles to reaching what they need when they need it. The D-style personality is always moving, and they need to get things done…NOW. Their desk will be set up to help them do just that. As you’re walking through the office, be sure to take notice of the different ways that your coworkers have chosen to organize their work spaces. It can tell you a lot about the personality style of the person, and give you great insight into the best ways to work together. If you’re interested in learning more about the interaction of personalities in the workplace, take a look at our Teams and Values report. It will help you understand more about how DISC can help you at the office, by showing you the ways that personality style can affect team dynamics, interpersonal communication, and motivation at the office.